Superb testimonial from Jon today. He’s certainly put the training effort in to get the results of a stronger and more robust lower back. “Ever since I can remember I’ve had back problems. I put it down to years of rugby, writing it off as something that will stay with me for life. I saw it as penance for treating my body with little respect. I seemed to get by and lived with the pain and immobility, but it would eventually take my down a dark path both physically and mentality. I looked at the ‘physio route’ as a expense that would provide just a temporary band aid to a deep rooted problem. That was until I meet Brian. Brian demonstrated and provided me with a gradual plan to right my wrongs. Educating and guiding me through basic body mechanics through to the specifics of strength and back conditioning. Slowly but surely I saw strength come back and the pain dissipate. 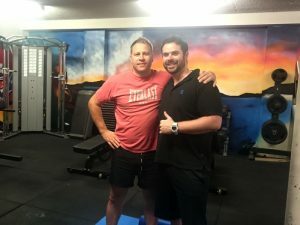 With that came a new mental health and confidence towards exercise which I will forever be grateful for.” – Jon Clark.